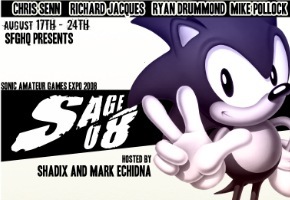 There’s been nearly critical acclaim all around going to one particular title at SAGE…and it’s not a Sonic fan game. Extra missions and quest available in the inn. NOT AVAILABLE ON THIS DEMO. 5 different elements with a total of 15 different spells. 32 different weapons, from simple daggers, swords and axes, to magic weapons with different effects. 100+ enemies to be found. Secret objects dropped by enemies under special conditions. Challenging. This is not an easy game. This first demo contains one dungeon and one field area. If you’re stuck, there’s a suite of tutorials available, and there’s a walkthrough you can read right on Blue Frenzy’s SAGE booth. The buzz right now is that this, along with Nothing, may be ones to watch potentially transcend into professional, original works.